Sen. Bernie Sanders (I., Vt.) acknowledged he was a millionaire Tuesday and credited it to his large book sales, telling the world, "If you write a best-selling book, you can be a millionaire, too." "I wrote a best-selling book," he said. "If you write a best-selling book, you can be a millionaire, too." Sanders has long railed against the U.S. economic system being rigged in favor of "millionaires and billionaires" as part of his populist message. Financial disclosure documents revealed Sanders made more than $1 million in both 2017 and 2018, chiefly from book royalties for Our Revolution in 2016 and the young-adult adaptation Bernie Sanders Guide to Political Revolution in 2017. He published another book, Where We Go From Here, in 2018. The democratic socialist, who is leading the declared 2020 Democratic presidential candidates in early polling, said he would release his tax returns on Monday, April 15, better known as Tax Day. 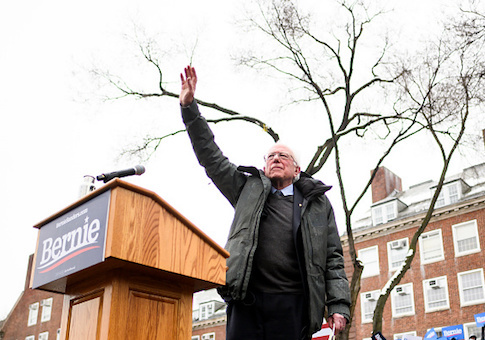 "April 15 is coming," Sanders said. "We wanted to release 10 years of tax returns. April 15, 2019, will be the 10th year, so I think you will see them." Sanders has come under fire for not releasing his tax returns, a common practice for presidential candidates with the notable exception of President Donald Trump. Several other Democrats have released theirs, including Sens. Kirsten Gillibrand (D., N.Y.) and Amy Klobuchar (D., Minn.), and Sen. Elizabeth Warren (D., Mass.) released 10 years worth of returns last year. Sanders bristled at comparisons to Trump, who has famously refused to release his returns. The White House has denied Democratic requests to see Trump's taxes, and Chief of Staff Mick Mulvaney told Fox News on Sunday they would "never" get their hands on them. "Not being a billionaire, not having investments in Saudi Arabia, wherever he has investments, all over the world, mine will be a little bit more boring," Sanders said. This entry was posted in Politics and tagged Bernie Sanders, Donald Trump, Mick Mulvaney, New York Times, Taxes. Bookmark the permalink.